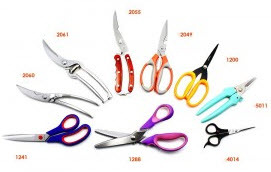 Import knives, scissors, shears and other cutlery from China with Walker World Trade. 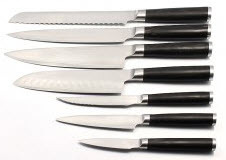 Are you searching for a trustworthy source of knives, scissors, shears and cutlery from China? Call Walker World Trade at (248) 644-7700 today for your China knives, scissors, shears and cutlery product sourcing and logistics needs. Walker works with offshore suppliers that stand behind their products. You won’t have to worry about the integrity of knife, shears and scissors suppliers discovered on the Internet. We’ll reduce your risks, manage your imports, including freight and Customs. The end result? Increased profits. 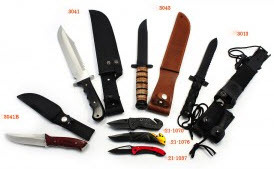 Depending upon whether you buy high quality, Damascus type knives or promotional or recreational knives, offshore manufacturers will usually require a minimum order quantity per type of knife. That minimum order quantity could be ‘bulk’ knives, or sets of knives (if you are buying a packaged assortment). Terms from our offshore suppliers are 30% down payment with the order, and the balance upon notification of booking with the steamship carrier. Walker will manage all ocean freight, United States Customs fees and filings, payment of duties and taxes and local delivery to your destination. Step 2: Call Walker World Trade at (248) 644-7700. We’ll discuss your project and learn about the product, and your goals, objectives, timetable, and target pricing. Step 3: If there are no design and development services required, we’ll send you information to the appropriate supplier. If you need design and development services, we’ll send you a feasibility proposal that will outline everything you need to know about importing the knives system of interest. 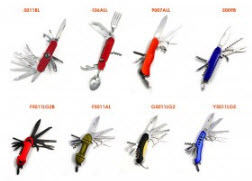 Throughout our 76 years of international trade management Walker International has aligned itself with reputable, trustworthy, quality-conscious and experienced offshore cutlery and knife manufacturers in China. Doing business for over 76 years, and over 100 trips to China and the Pacific Rim, results in developing relationships with offshore factories in a broad range of industries. Our factories stand behind their product. And when you work with Walker’s factories, whether in China or other countries in the Pacific Rim, or Europe, you know what you are getting, unlike searching the Internet for offshore factories that can place their ads in any search engine, and look ‘good’. Experience counts. We’ve got it. Others don’t.